33631 Playful Cherubs Fountain home decor, jewelry, decor, decorations, electronics, fountains, floor mats, art glass, vases, garden essentials, fireplace screens. 33631 Playful Cherubs Fountain, Free Shipping !!!! 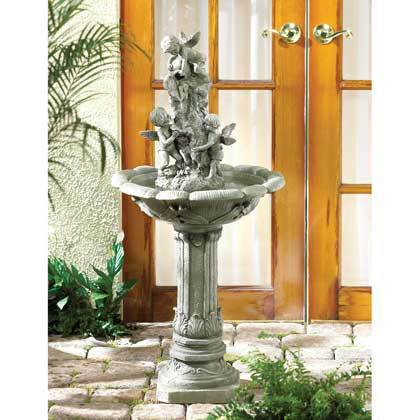 Water cascades over playful cherrubs in this enchanting home or garden fountain. Classically styled with flowing lines and faux granite finish. UL Recognized. Alabastrite. May require additional freight charge. 19 1/2" x 9 1/2" x 42" high.